When cracks start to appear in your asphalt parking lot, road or street, filling them with the proper material – such as the crack fill used by ACT Asphalt Specialties – can easily extend the longevity of your asphalt surface. 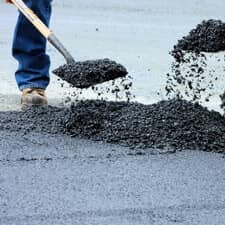 The crack filling specialists at ACT Asphalt Specialties know firsthand that properly repairing cracks in your asphalt will prevent moisture from seeping under your asphalt surface and causing damage. Crackfilling will also eliminate weeds and grasses from growing within your asphalt. As the roots of the invading vegetation grow larger, they will push the pavement up causing the surface to crack even more. As most drivers know, when water penetrates a crack and seeps under an asphalt surface, it turns into a soft spot — and eventually a pothole. Water penetrating under your asphalt surface causes even larger problems during the freeze-thaw cycle when ice forms under the pavement. Fortunately, practicing good maintenance and filling cracks as soon as they develop can help you to avoid these problems. For more information on how ACT Asphalt Specialties’s professional asphalt crack filling contractors can improve the curb appeal of your business, contact us today or call us directly at (651) 484-1696.